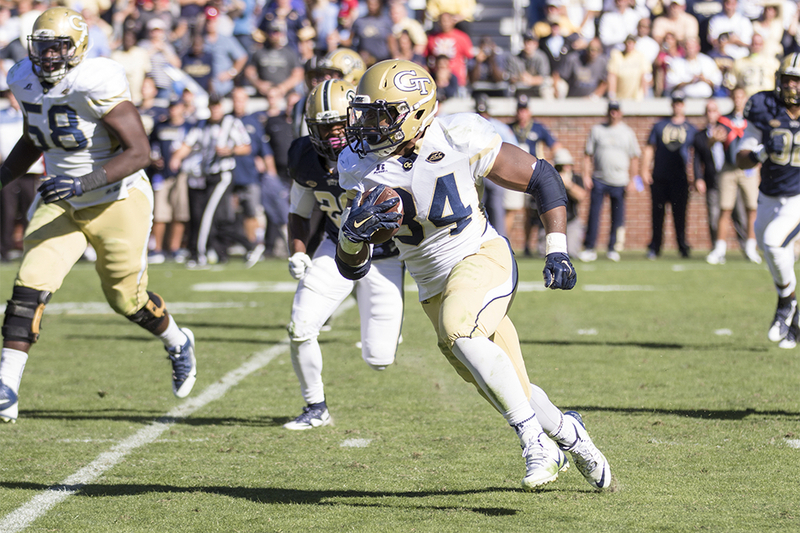 Freshman running back Marcus Marshall may be young, but he has already made his presence felt on the 2015 Yellow Jackets football team. Hot off of big games against Pitt and Florida State, Marshall spoke with the Technique about Tech’s win against the Seminoles and his transition to playing college football. What was going through your mind when Lance Austin returned that field goal for a touchdown? Marshall: You know, during the play I was kind of in shock, but, when I seen him, you know, coming around the corner, I knew it was about to be six. So I was just real hyped. Marshall: I expected to win, to be honest with you. You know, I felt like we could beat that team in the end. Now, the way we won, I know you can’t really expect that. I did expect to win, but the way we won was just awesome. Did the fact that it was homecoming add some meaning, or was it just another sixty minutes of football? Marshall: I don’t know. I think we were just going out and playing more football. Being homecoming, being a night game, being the white-out, all that just adds extra hype, but like you said, just a football game. Florida State has had one of the better run defenses in the country this year. They only allow 135 yards per game, but you guys got 261. Do you credit the offensive linemen, the game-plan, the backs, everyone? Marshall: I just think that’s a collective offensive effort. That’s the kind of offense we have; we expect to run for more yards than any other offense, so that’s just us doing our jobs. After the game, did you feel a momentum shift in the locker room? Is this a confidence booster or just another win? Marshall: I definitely think it’s a real confidence booster, but at the same time we do understand that you gotta keep moving forward, keep getting better, because the season’s not over yet and we’ve still got tough opponents to play. Your brother [Keith Marshall] was arguably the best running back in the country coming out of high school. Do you feel any additional pressure because of his success? Marshall: Not really, I don’t feel any pressure. I mean, watching him do what he did in high school has just motivated me to work other and to just want to be like him, but I don’t feel pressure. In under a year, you’ve gone from carrying the load at Millbrook High School to carrying the load at Tech. How do the two offenses compare and what’s helped you make the transition? Marshall: Having some older guys on the team to show me the ropes, help me learn the offense. I don’t think I really carry the load here; we’ve got plenty of running backs. But it’s been a good transition so far. Coach Johnson mentioned that you’ve got “a mile to go” in terms of your blocking. How do you work to improve that on a week-to-week basis? Marshall: Just watching film, trying to get a better understanding who I need to block and how to block him, and just reps, really. Taking more reps at it. You guys have dealt with a lot of injuries in the backfield — both Broderick Snoddy and Patrick Skov have missed time. How has the offense approached filling that void? Marshall: It’s just the next guy up, really. You’ve gotta try to move forward, and whoever’s coming up next needs to do their job. Your game this Saturday is against Virginia, whose only wins this year have come against William & Mary and Syracuse. How do you avoid a mental letdown after the emotional win last Saturday? Marshall: I mean, if you looked at us last week, you might have said something similar. You can’t go into the game with that mindset; you’ve just gotta feel like every opponent is going to be good. I mean, it’s the ACC, so you’ve gotta go into every game with the same mindset. You can only lose one more game and remain bowl-eligible. Has that affected the team’s mentality? Marshall: We definitely understand what’s in front of us, but I just think it’s going to help us work harder to get these Ws.